Not far from where yesterday's photo was taken, this is another view of Irancy in Burgundy with more of the vineyards visible. You can see how the vines cling to the hillsides above the town. I was struck by how steep the vineyards are in Irancy, Chablis, and farther west in Sancerre compared with the very gentle slopes here in the Touraine region. If I had to walk Callie up and down in these vineyards, I'd probably be in much better shape! As we wound around the vines along the little road into town (you can see a section of the road just to the right of the tractor), we passed a huge tour bus coming up the hill. We made it through unscathed. Not far from Chablis in Burgundy is the small town of Irancy, home to about three hundred people. Apparently the place has lost about two-thirds of its population since the nineteenth century. 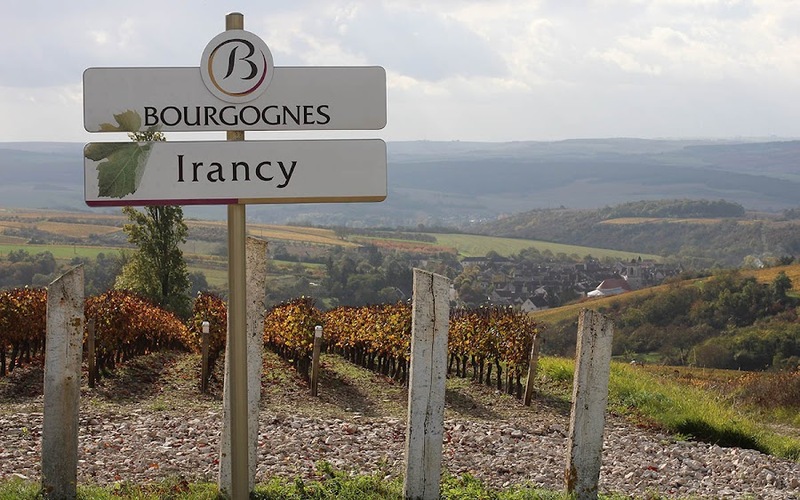 Irancy is known for its red wine, made primarily with pinot noir (as most red burgundies are). They also grow another grape for blending called césar, a grape that, as its name implies, was brought to the region by the conquering Romans oh so long ago. Looking down into Irancy. You can see the town and its impressive church in the center-right. Irancy is a pretty town; it sits in the bottom of a kind of natural amphitheater, the sides of which are planted in vineyards. It's a very impressive sight and I'll be posting a few views over the next days. For now, here's the sign that greets visitors just as they begin their descent through the vines and into town. In the never-ending quest to improve my photography, I did a little exercise while we were in Burgundy. No, not jumping jacks. I only used one lens (with one minor exception). I have four lenses for the camera: an 18-55mm zoom (which is the lens I use most often), a 70-300mm zoom for long shots, a fixed 100mm macro for close-ups, and a fixed 50mm/f1.4 lens. On one of the online photography sites I read, the author talked about prime (fixed) lenses and why she prefers them to zooms. For instance, she noted that fixed lenses often have better quality glass because there is less of it in the lens. Zoom lenses force light through several layers of glass and sometimes a fixed lens produces sharper, better quality images. She also noted that fixed lenses can have wider apertures allowing for more versatility in low-light situations. My 50mm prime, with it's maximum f1.4 aperture, is the widest of the four lenses I've got. The author suggested forcing yourself to use just a prime lens for a period of time to get a feel for it, so that's what I did on this trip. La Fosse Dionne, Tonnerre, Burgundy. 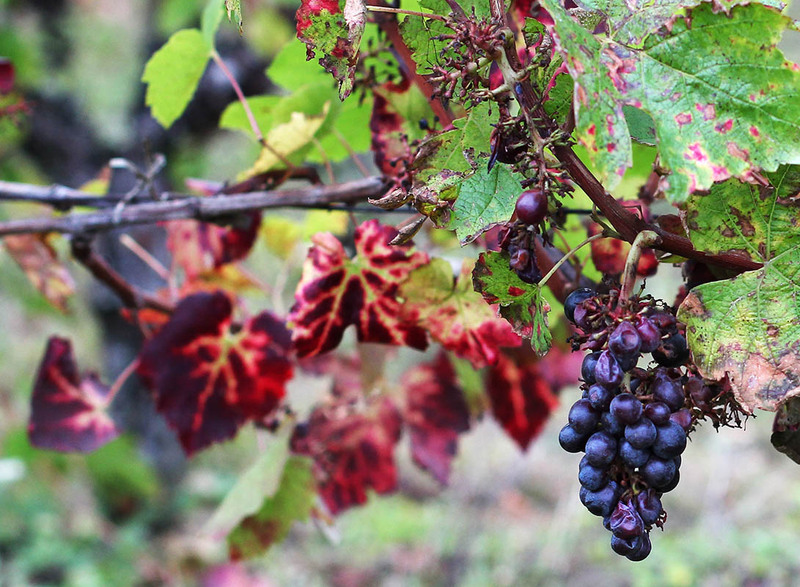 All of the photos I'm posting from our Burgundy trip were made with the 50mm prime lens. It was a bit of a challenge as I'm very used to being able to frame a photo by zooming in and out, and I can get wide photos in tight spaces with the 18mm wide angle; 50mm is not a very wide angle. With a fixed lens, zooming has to be done on foot, walking toward or away from the subject to frame it the way you want it, and that is not always possible in narrow streets, inside buildings, or at scenic overlooks. Today's picture was taken in the town of Tonnerre at the site of a source, or spring, called la Fosse Dionne. 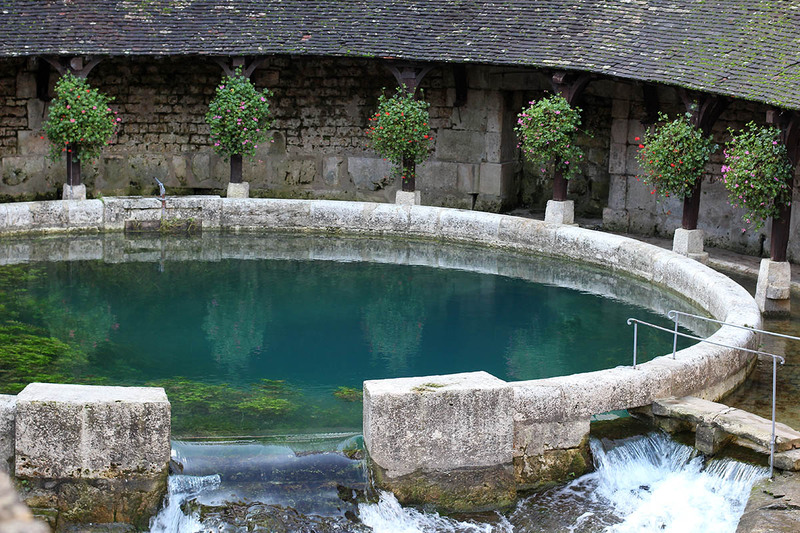 A circular enclosure was built around the spring in the 18th century to serve as the town's public laundry. The spring and its enclosure are nestled tightly in the old neighborhood with buildings all around, so getting back for a long/wide shot was not at all possible. This image was the best that I could do with the 50mm lens. One of the points of the exercise is the challenge to take an interesting shot without relying on the zoom. In this case, I tried to capture the feel of the spring and its circular enclosure without being able to get it all into the frame. Ken used his wide-angle zoom and got some really nice shots of the whole place. He'll probably post some of them on his blog soon. Not far from where we stayed in Burgundy is the town of Tonnerre, a small burg of about five thousand people that dates back to Roman times. Its streets and buildings climb up a steep hillside in the valley of the Armançon River along a historical route between Paris and Dijon. In the ninth century, the church of Saint-Pierre (Saint Peter) was built on a high point above the town. It was destroyed in a fire and rebuilt in the sixteenth century. 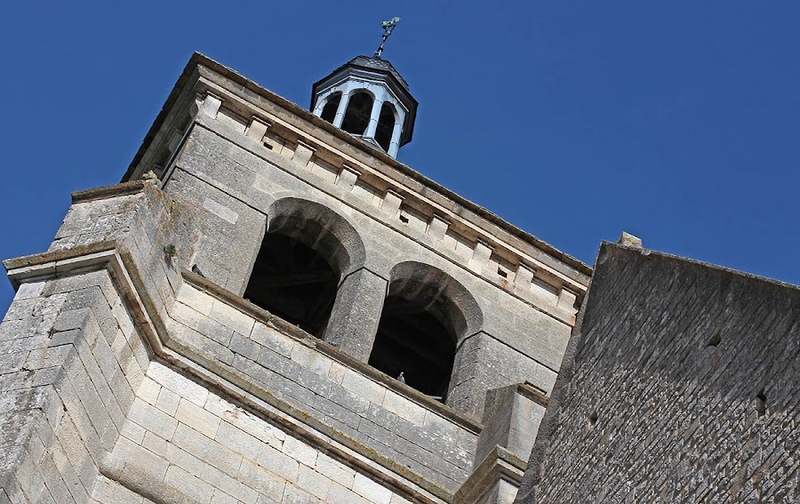 The bell tower of the church of Saint-Pierre in Tonnerre. Can you see the pigeon under the right-hand arch? While it's easy to walk up to the church from the streets of town, cars are sent high up above the church before they can wind their way back down to it. We had the car and the dog, so we drove. Unfortunately, the church was locked up tight and we didn't get to see inside. But we had a nice walk around the outside and took in the views over the town's rooftops. 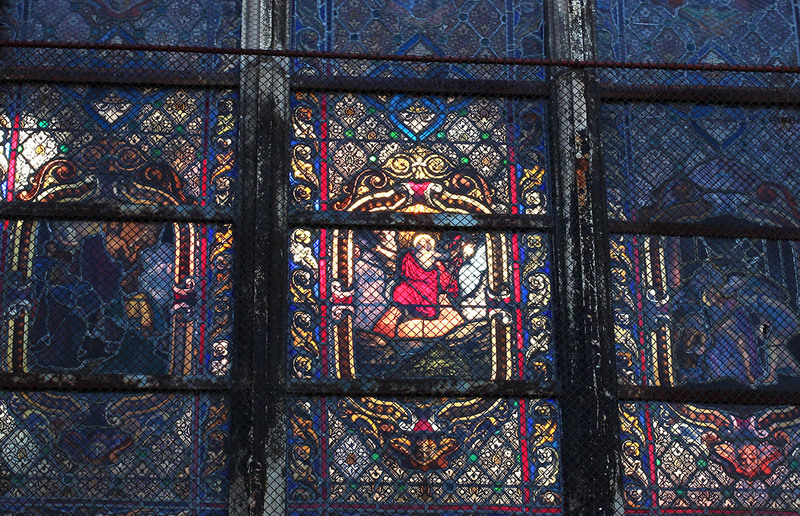 One of the church's stained glass windows, seen from the outside. The sunlight was shining through the building from the other side. 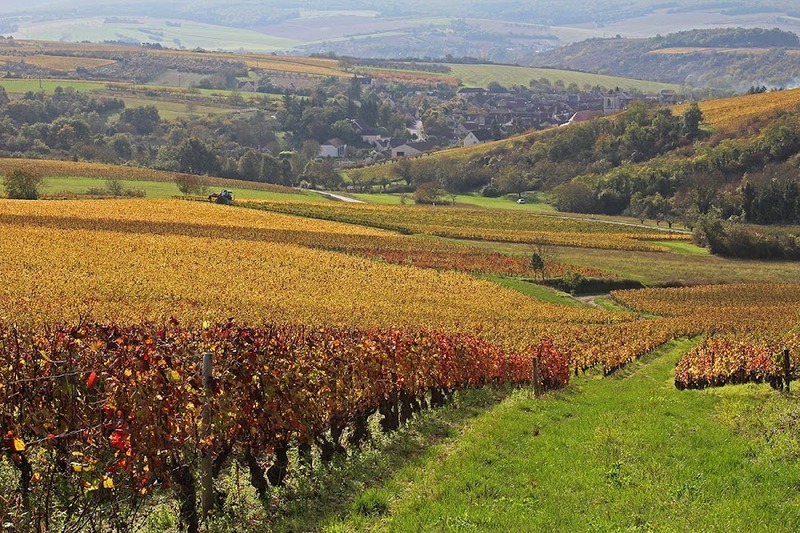 The hillsides surrounding the town of Chablis in northern Burgundy are planted in chardonnay. 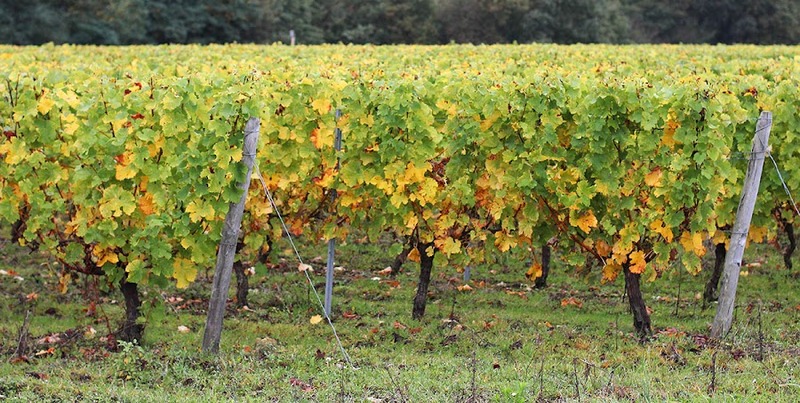 All Chablis wine is made from chardonnay. If I understood correctly, there are four "grades" of Chablis depending on the location of the vines and their exposition to the sun: Petit Chablis, Chablis, Premier Cru, and Grand Cru. Each vineyard parcel is classified into one of these four appellations. 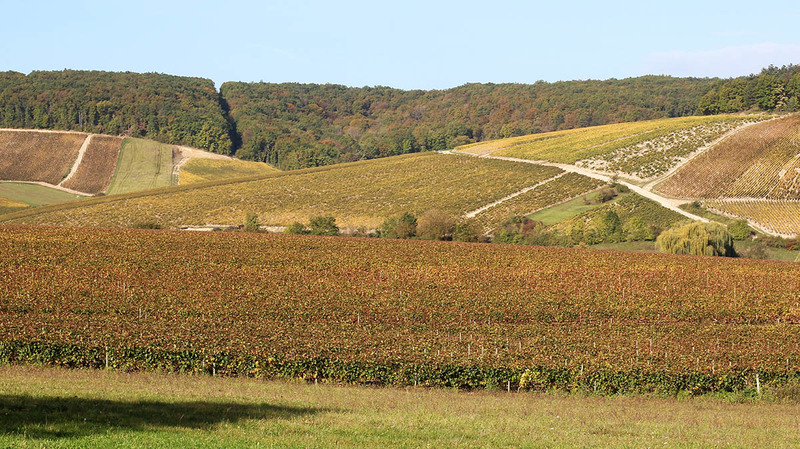 Chablis and Chablis Premier Cru vineyards called Les Fourneaux and Côte des Prés-Girots near the town of Fleys, just east of Chablis. The harvest was over and done and the wine making under way when we visited last week. But there was still a lot of activity in the vineyards. We could see workers pulling up dead vine trunks and replacing support posts. The leaves on the vines were beautiful shades of yellow, orange, and gold. Ken and I stopped into two places to taste and buy wine on Wednesday morning. The first was a winery I knew of because they had a booth at one of our local wine events last spring. The second was the local wine cooperative (La Chablisienne). Yum! 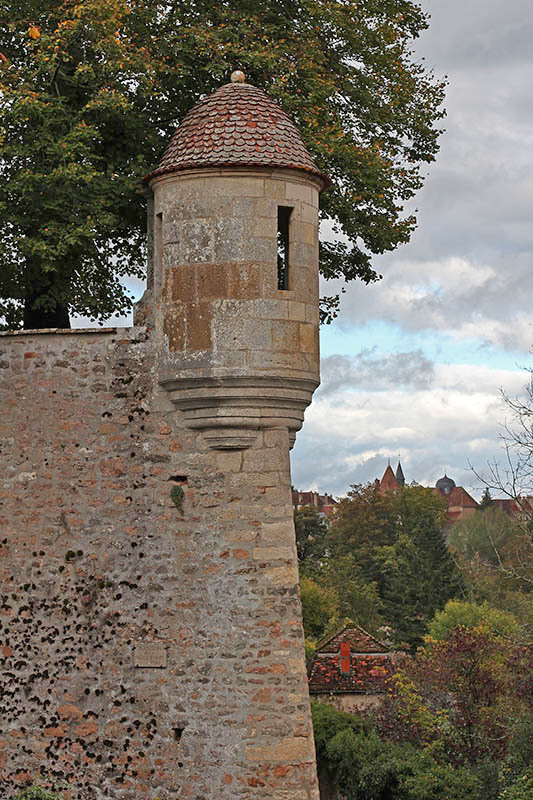 This is a watchtower, called an une échauguette or une guérite in French, on the ramparts of the Burgundian city of Avallon. A sentinel stationed inside the turret would be sheltered from the elements and from view, but would be able to see any movement along the approaches to the city. A sixteenth century watch post on the ramparts of Avallon. 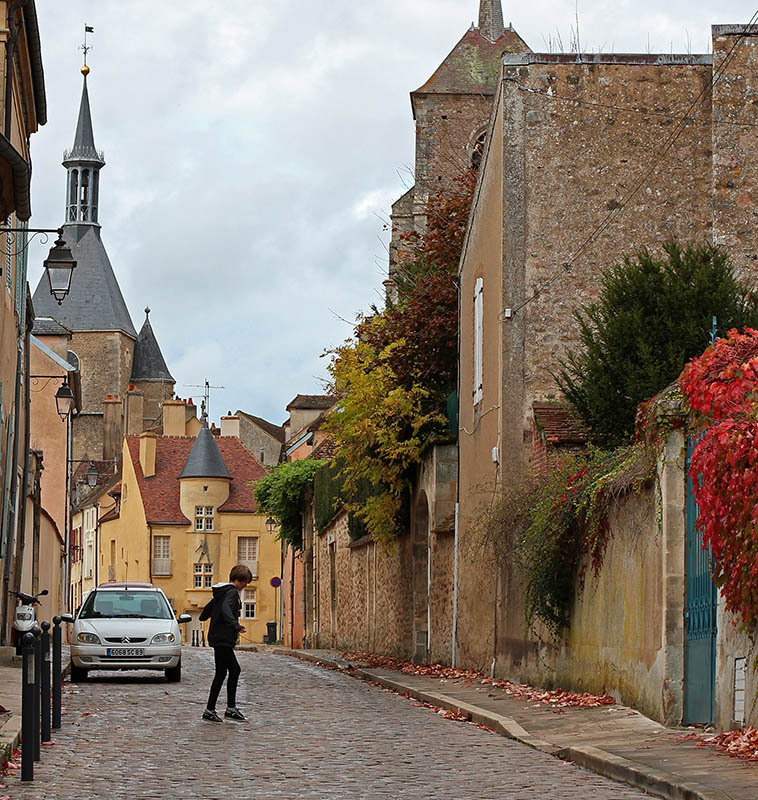 After we took a few photos here, we made our way around the city and back to our route toward Chablis. Ken, Callie, and I took a short road trip this week to northern Burgundy, very close to Chablis. We rented a small gîte (vacation house) in a small village for three nights and spent a couple of days touring around and tasting wine. We didn't have the best weather, but it wasn't a washout, either. Just a glimpse of central Avallon. I don't know who the kid is. The drive over took us about four hours. We set out in the morning and arrived in Pouilly-sur-Loire four lunch, then drove on toward Chablis. We stopped in a couple of towns for a look along the way and to give Callie a chance to stretch her legs. The town in this photo is the Burgundian town of Avallon, built on the heights above the river Cousin. After driving through the historic center (very slowly), we spent about fifteen minutes in a small park on the ramparts. The view is from the park back into town. You've seen this one before. It's the stone storage shed in the vineyard behind our house. It's one of what I imagine are hundreds sprinkled throughout our region. They were once used for tool storage and as a refuge for vineyard workers in the days before it was easy to hop in the car and go home for lunch. 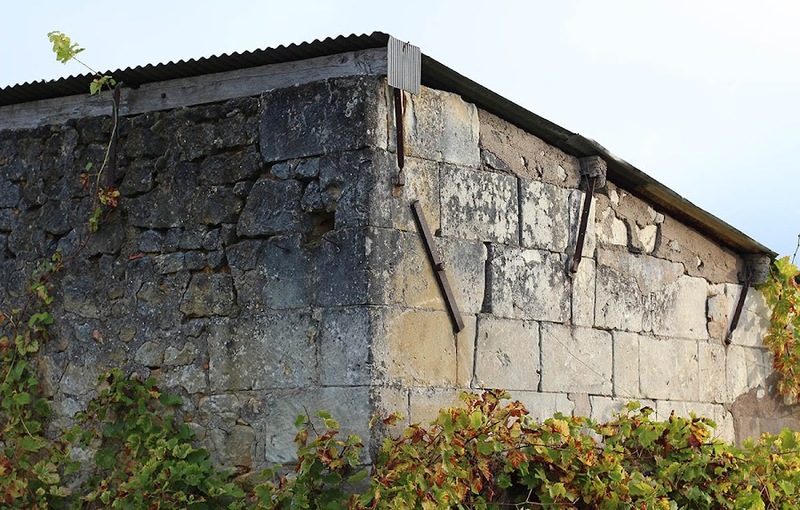 This old shed is made with a mix of stones and concrete blocks and has been patched and shored up over the years. Most of the cabanons du vigneron that I see around here are more or less abandoned and not used for much anymore. This one is closed and locked up; others are left open to the elements and wildlife. Those are grape vines planted around the shed. They produce grapes (but they're not harvested for wine), and the growers prune the vines back every year. 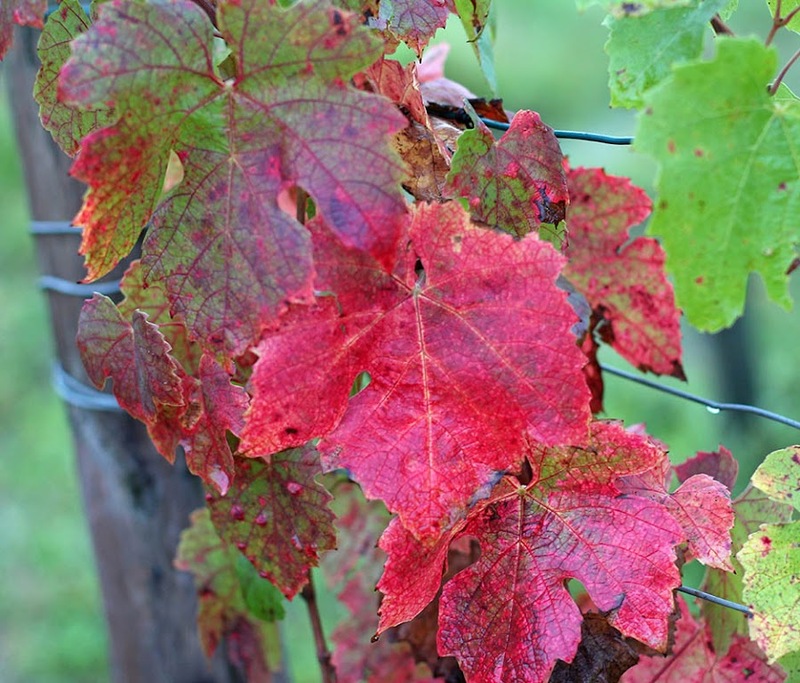 I recently mentioned how, when the leaves change color in the fall, I can clearly see where one grape varietal ends and another begins out in the vineyards. 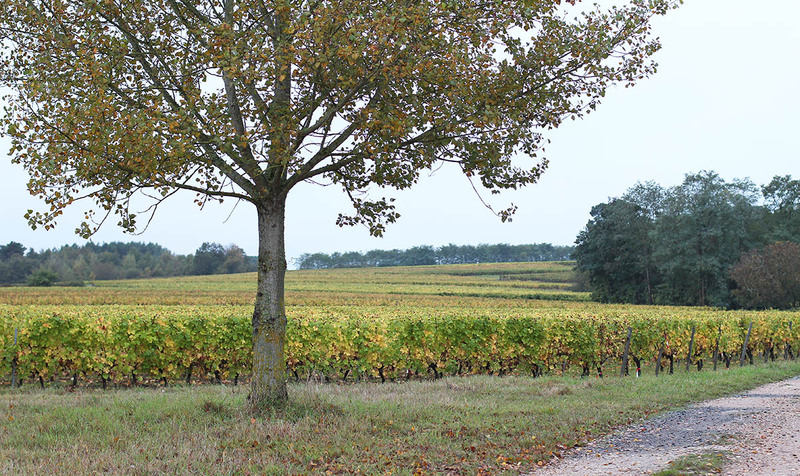 Around us there is a mix of the varietals used to make Touraine wines. Among them are gamay, cabernet, and côt for the reds, and sauvignon blanc, chenin, and some chardonnay for the whites. White grapes on the left (probably sauvignon) and red grapes on the right (I don't know which). Here and there you can also find, if you know what you're looking for, local grapes like grolleau and pineau d'aunis. They're grown in lesser quantity and are used mostly for blending, although the pineau d'aunis makes an excellent dry rosé which is one of my favorite wines. From a distance, you can clearly see the transition from one varietal to another. Throwback Thursday has taken today off. 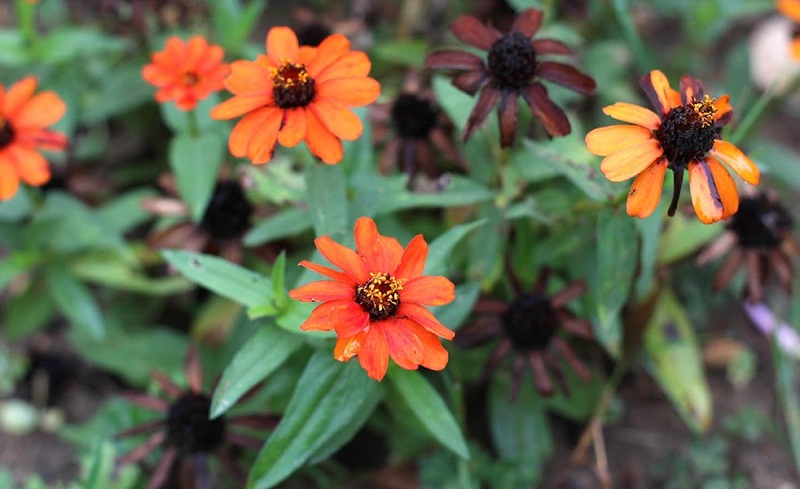 Not many summer wildflowers make it into the fall. The notable exceptions are the whites of the wild carrot, or Queen Anne's lace, and the blues of wild chicory, pictured here. The flowers open when they're warmed by the sun. Otherwise, they stay closed up. 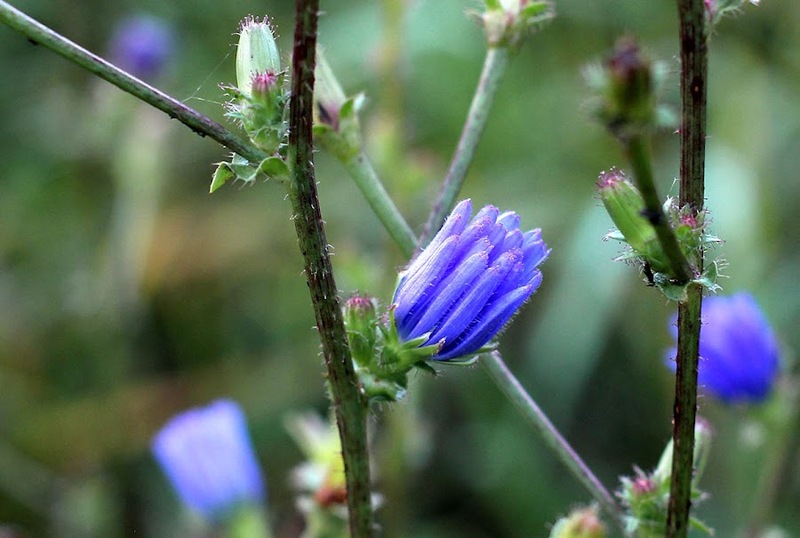 Wild chicory grows in and around the vineyard. Even the wild carrot is mostly brown among the drying grasses these days, but there are still white blooms here and there. They should persist through November. I suspect that, now that we're back to normal fall weather, the changing of the leaves will accelerate a little. For now it's mostly the leaves on the grape vines that are showing off, but there are subtle signs of change everywhere. The vineyard road winds back and forth through this view toward the west. Some of you may recognize this as the view we have from the west side of our house, but I wasn't in the house when I took the picture. I was out "in" the view itself. These are the vineyards that we walk through daily with Callie. Here's Bert sitting with me on the deck on Saturday. The weekend's weather was very summery and we enjoyed being outdoors. It may be the last time this year as the weather is predicted to go back to normal starting today. 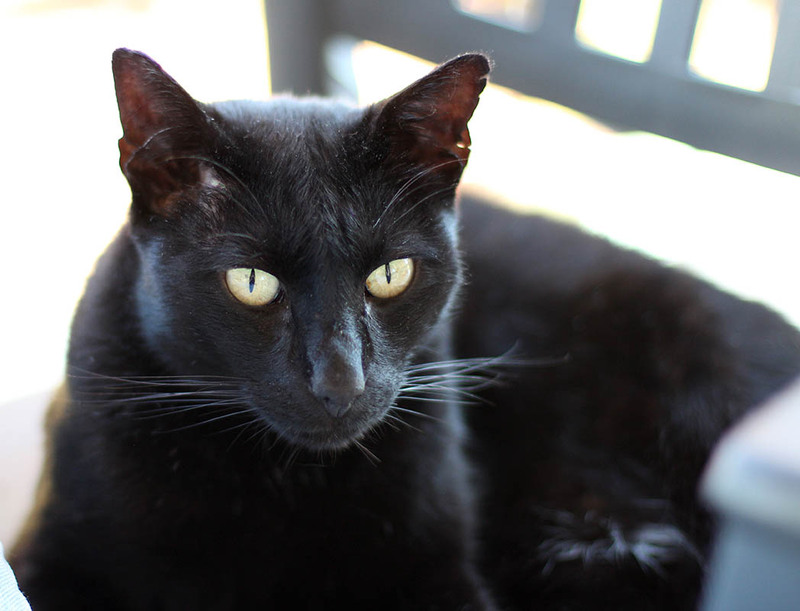 Bertie the black cat. Boo! I often see Bert late in the afternoon sunning himself in the driveway. He curls up next to the log pile and snoozes. As the shadows chase the sun away, Bert shifts his position until the shadows win, then he heads out to find another spot. We're enjoying a brief, but welcome, spell of warm weather. T-shirt weather in mid-October. Very nice. But it won't last much longer. The days are shorter, the sun is lower in the sky, and the leaves are turning and falling. The vineyards are putting on a show. Fall colors in the vineyard. And, because it's Sunday, it's a hunt day. I have to get out and back with Callie before nine o'clock. That's when the hunters show up. We want to be well out of their way. Our house has a north-facing window in the living room and we like to keep window boxes just outside. Since it doesn't get direct sun, we've often planted impatiens out there. They provide a lush green and colorful blooms in the summer. A few years ago, our local garden shop stopped carrying impatiens because their crop apparently got some disease. So we turned to coleus for the north side window boxes. 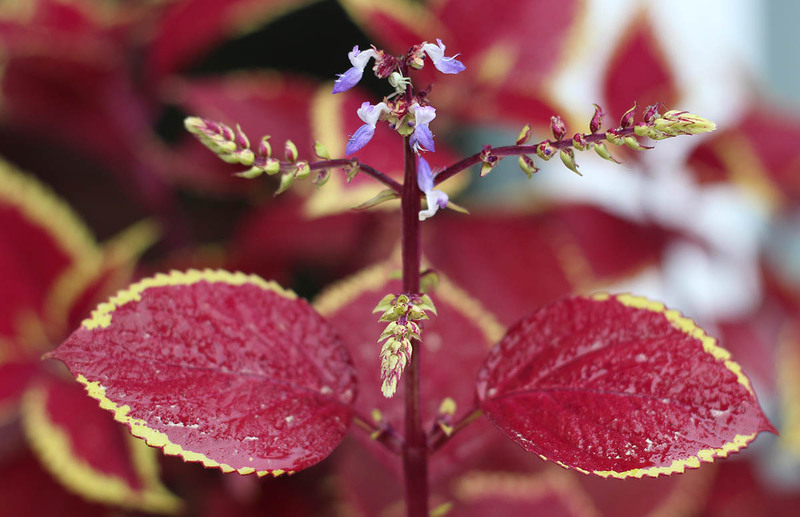 Our coleus beginning to flower. There's a white crab spider hiding on the stalk at the very top among the flowers. The coleus provide nice color outside the window from spring through fall. And we've found that they're easy to root from cuttings for more plants. If we're careful, we can keep them going indoors through the winter for another spring crop. This is not how raisins are made. But you'd be forgiven for thinking so, given the state of these bunches. In French, the word raisin means grape. What we Americans know as raisins are called raisins secs (dry grapes) in France. It's similar to prunes (plums) and pruneaux (prunes). I think that when similar words in both languages mean different things they're called faux amis (false friends). It can be a little confusing until you get used to it. 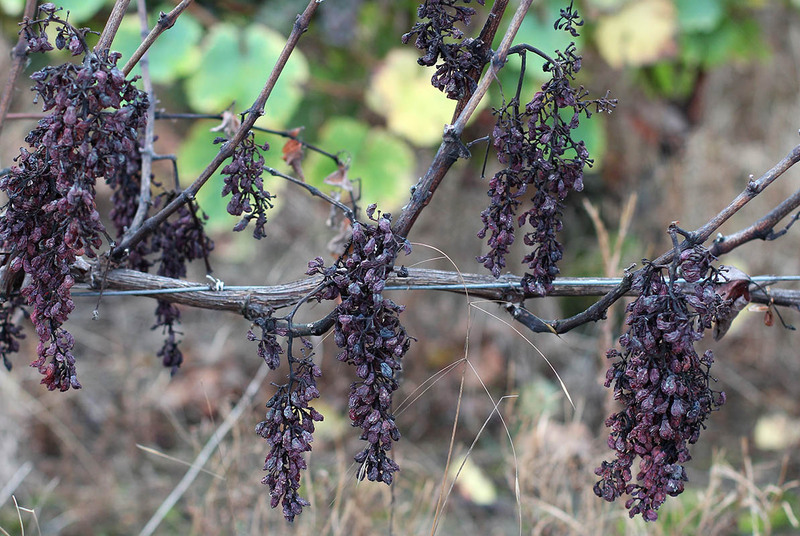 I think this vine might be sick; the leaves all dropped and the grapes dried up before the harvest. We had a decent rain event last evening and overnight. I haven't checked the gauge yet to see how much rain we got, but we were expecting something approaching an inch in all. It's all over now and we're expecting an unseasonably warm weekend. It's time to get a bunch of yard work done while we can. It was nine years ago today that I started this blog, on the occasion of my return from my first trip back to the U.S. since moving to France. I spent a week in upstate New York to see family and friends, then another week in the San Francisco Bay Area with friends. This photo is from a dinner out in a French restaurant in Silicon Valley; I think it was called "Brigitte's" and it's now gone. 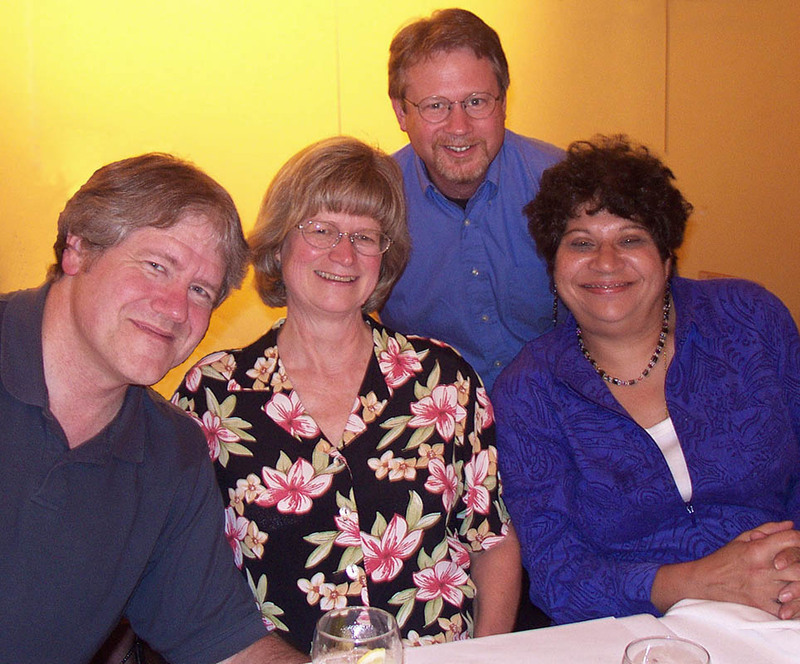 Left to right: John, Candy, me (in back), and Cheryl. A good time was had by all! Blogging was relatively new back then and I was looking for a way to share photos and stories about our new life in France with friends back in the U.S. Until I started the blog, I was sending emails with photos. Ugh! So 20th century, especially for 2005. So, here we are, nine years and 3,004 posts later, and it's still going on. I don't know how much longer it will last, but I'd like to make it at least to ten years. Facebook seems to be sucking up much of what little attention spans people have left these days. I find FB a little overwhelming and lacking in the personal design elements that a blog can offer. Such is life. I also preferred beta to VHS and look how that ended up. The autumn leaves are beginning to fall. Mais elles ne se remassent pas à la pelle, pas encore. It's way too early to start raking. I usually wait until most, if not all, of the leaves come down before I deal with them. Normally we move the big maple leaves out front onto the garden plots to keep weeds down over winter. Some of the linden tree leaves out back get used that way, too. The leaves that fall on the grass will get mowed into mulch. Autumn leaves getting ready to drop. On Tuesday, Ken had some errands to run, so I did not cut logs. I don't want to use the big chainsaw when I'm home alone. So instead, I worked on cutting down spent flower stalks and grinding them up for the compost pile. They're the tall yellow sunflowers I posted about recently, and we have two patches of them. When the flowers fade, they don't look so nice, so I cut them off at about a foot high. They're very invasive and in one place had started to grow into our pathways, so I pulled as many of them as I could, along with their webby roots. Into the chipper they went, then onto the compost pile. Our little patch of blettes (Swiss chard) is still doing well. We've had several good harvests so far and they continue to produce nice leaves. We're lucky to have them; I planted the seeds in two rows last spring, but the weeds grew faster than the plants and took over the plot. I thought the chard got choked out. One day Ken went out and pulled the weeds and noticed a couple of little chard plants among them. We continued to weed around them and they got stronger all summer. Now we're enjoying them on the table. Most of the chard stems are white, but we got one plant with yellow stems from a different batch of seeds. 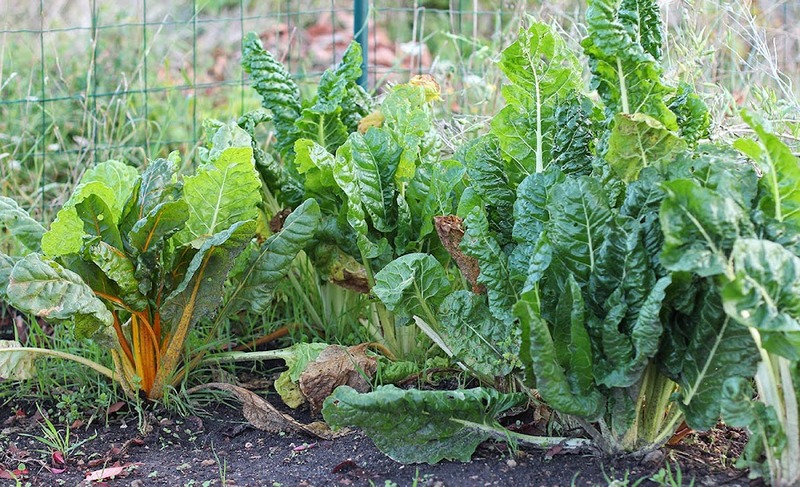 Chard leaves are very tender and sweet, much more so than spinach. The ribs are also very good, but take a little longer to cook. I'm hopeful that these will continue to produce through the first frosts of the season. The vineyard has begun its annual transformation. Soon it will become a sea of yellow and gold and crimson before going brown, then bare, for the winter. It's always fun to watch, until a blustery day blows all the leaves to the ground. I think these are sauvignon blanc vines, their leaves turn a vibrant yellow. It changes a little bit each day. In some parcels you can really see the difference between varietals as their leaves turn different colors. 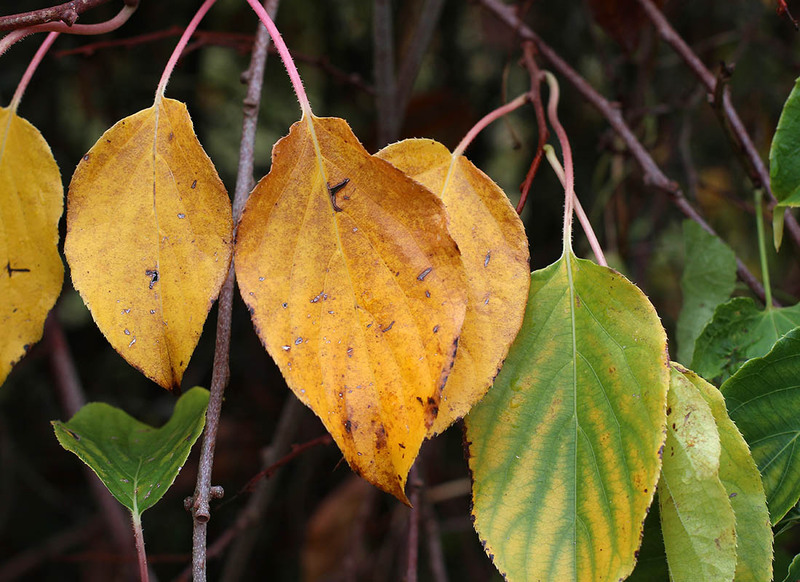 The line of demarcation between red and yellow leaves is hard to miss. I'll try to get a photo of that soon. The grape harvest is winding down now. Most of the grapes have been picked, except for certain parcels here and there. I know that one of the parcels out back is planted in chenin blanc, and the grower leaves that for his late harvest wine. But there's also at least one parcel of red grapes that I know of that still needs to be picked. The bunch on top was taken by the harvester, but the bunch below was left behind. This bunch of grapes was missed by the mechanical harvester. It's at the end of a row and sometimes the machine doesn't get up to speed soon enough to get the first bunches. The wildlife will probably enjoy them sooner or later. 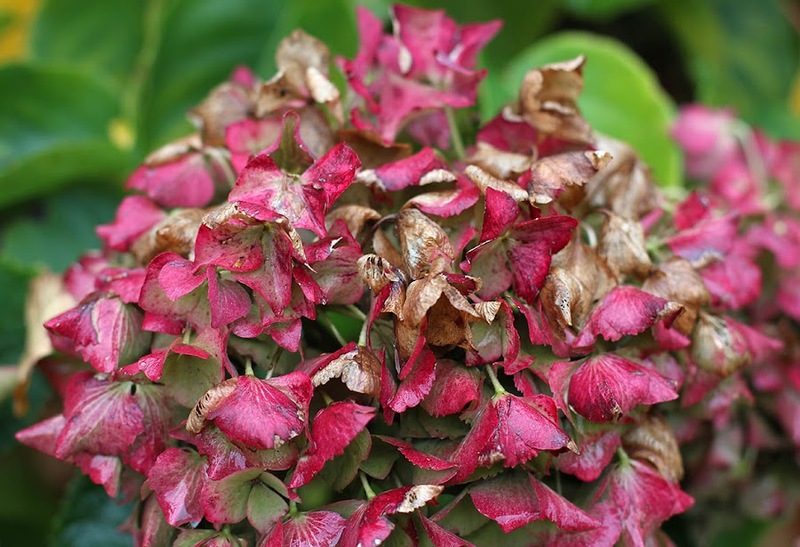 Even in decline, hydrangea flowers are decorative. We have one large plant on the northeast corner of the house from which I made cuttings a year or so ago. The cuttings rooted and I planted them in pots, and now they're in the ground. They've grown a little, but I suspect that they're working harder on roots than on leaves this first year. I'm looking forward to next spring to see how much more they grow. Pink hydrangea flowers as they fade away. Today I plan to get the chainsaw out and running (change the chain, add fuel) and get started on sawing logs. We stacked them all on Friday morning so the driveway is clear. Now for the long haul of cutting each meter-long log into thirds. Last year I was able to do about thirty logs (sixty cuts) each day before lunch. Because I have wine with lunch, I stay away from using power tools in the afternoons. Besides, there's usually a tennis match or a football game to watch on television. These are dahlias, I think, in our neighbors' garden. She has a guy that comes to weed and trim and do general gardening chores. She's nearly eighty, after all, and her husband is well into his eighties, so they can't do much more than putter around. She enjoys her flowers and fruit trees, though, and we often see her out watering or doing other light maintenance. Pink dahlias in our neighbors' garden. 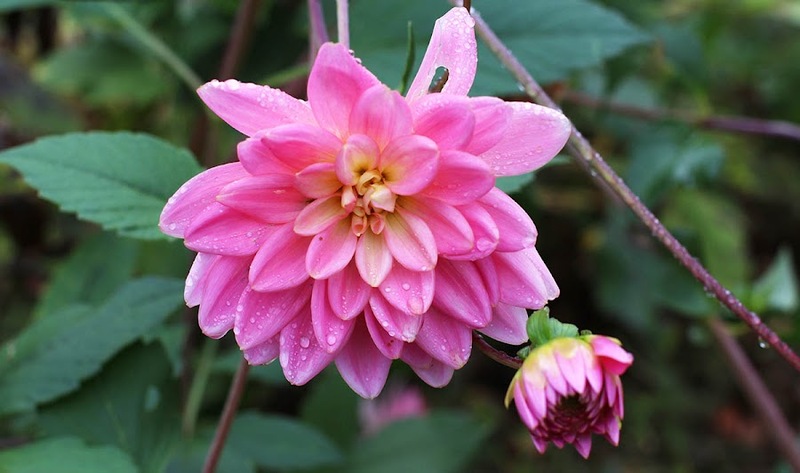 We had dahlias in our garden for a year or two. I think we dug them up when we re-arranged things in the vegetable garden. I left the tubers in a box for years -- they may still be around somewhere -- and I'm sure they've shriveled into nothing by now. I should find some more. They are perennials and relatively easy to grow. I think the year was 1994, twenty years ago now, when Ken and I spent a few days in Las Vegas with my cousin, Kim, who flew in from Florida. We stayed at the then-brand-new Luxor hotel, a sleek black high-rise pyramid with the full blown ancient Egyptian theme. It was my first time ever in Las Vegas and we had a great time taking it all in. 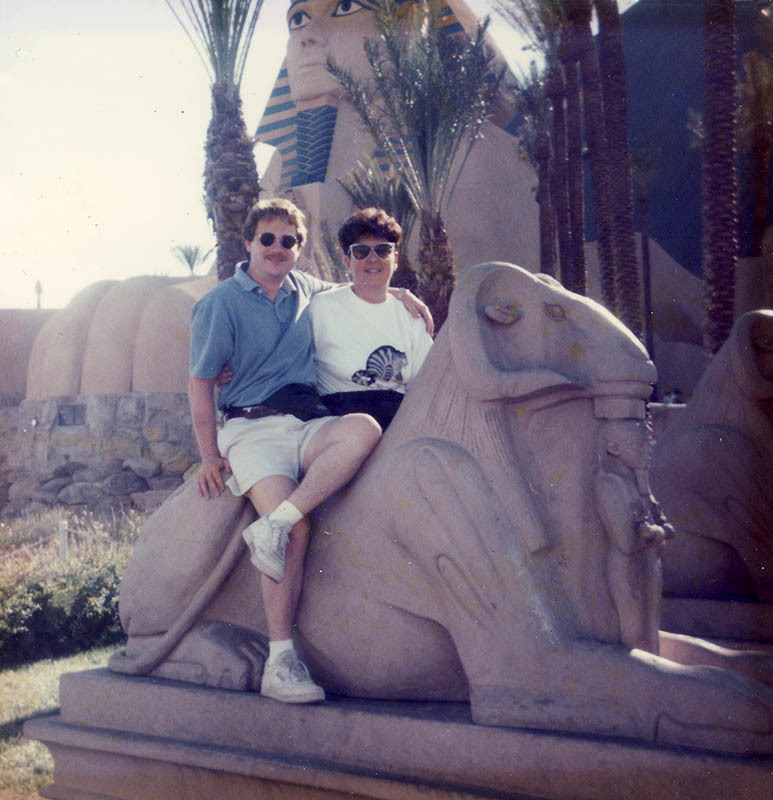 Me and my cousin in front of the Sphinx at the Luxor resort, Las Vegas, summer 1994. It was August and hotter than heck outdoors. So hot, in fact, that one night, after a fancy dinner with lots of adult beverages, we actually took a taxi across the street to the MGM Grand hotel for some gambling fun rather than walk (five of us stuffed ourselves into one cab). The next day we were terribly slightly hung-over and spent the day poolside at Luxor. Kim rented one of those cabanas with cool mist, a stocked fridge, table service (more drinks), and a cabana boy that came by every hour or so to put cold towels around our necks. Ah, that was the life! Blurry photo of me hanging out in the cabana at poolside. We actually ended up going back to Las Vegas again with Kim a few years later. That time we stayed at Caesar's Palace. Again, we had a blast. We even visited the Debbie Reynolds museum. A few years ago, Kim left muggy hurricane-prone Florida and moved to Las Vegas, and she loves it. Like they say, it's a dry heat. Next to our fireplace, where the wood-burning stove is, we keep a basket for what I call "burnables." They're paper wrappers and other small things that we can use to help light fires in the winter. When the basket fills up, I bag up the contents and store it in the garage for winter. We burn egg cartons, bread bags, some paper, and wooden camembert boxes. 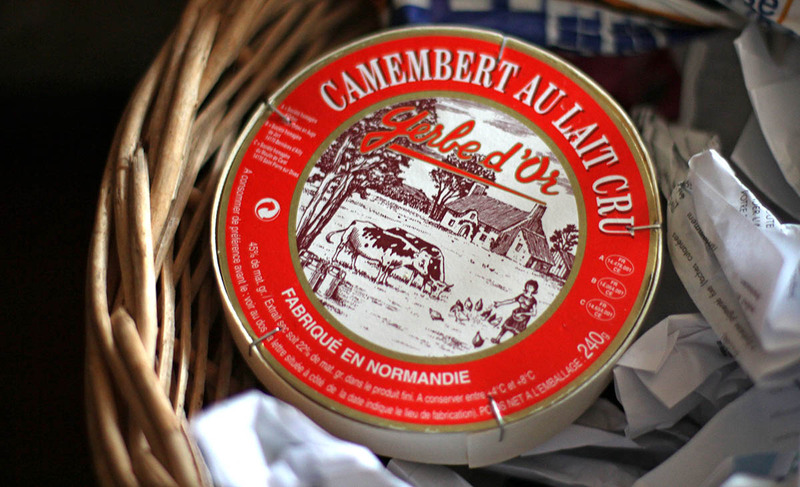 A typical wooden camembert box that will help light a fire this fall. This is a recent cheese box that is only noteworthy because the name of the cheese, Gerbe d'Or, is the name of a restaurant where we recently had lunch. The restaurant is in Loches, nowhere near Normandy where the cheese comes from. By the way, une gerbe is a bundle of grain, like wheat, arranged with their long stems all pointing the same way, often tied in the center. So, une gerbe d'or is a golden bundle of grain, an icon of a bountiful harvest. By extension, it's also the term for a spray of flowers as you'd see at a wedding, a funeral, or other official ceremonies. The word gerbe can also refer to a spray of artillery fire, and in it's verb form, gerber, it's a slang term for losing your lunch (which itself is a euphemism for, well, you know). 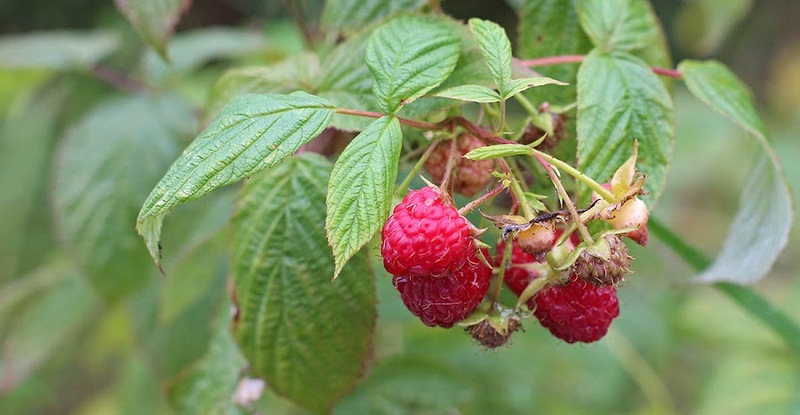 I planted a couple of raspberry bushes last spring. They've grown a little and even produced a few berries this summer, but nothing like the quantity of berries our neighbor gets. Of course, her bushes have been in the ground for more than ten years. They start producing in the early summer and don't quit until winter. I took this picture on Sunday. Framboises (raspberries) in our neighbors' garden. After I snapped the photo, I picked and ate a handful of the berries. Delicious! The neighbors are not there now, so it's okay. When they were here on Friday, I noticed that she was out picking a bowl-full of berries. I hope that my plants will produce more fruit next year. Time will tell. I can tell it's fall. The leaves are beginning to turn, and so is the weather. It's a nice time of year. And this year the fall is coming in gently. I took the camera over to our neighbors' garden where I saw some pretty leaves and thought they'd make nice pictures. Some nice flowers are still blooming. I don't know what these are called, but they're very pretty and are perfect fall flowers. We got five millimeters of rain overnight on Saturday and the forecast is for more unsettled weather in the week to come. But it's supposed to warm up again to seasonable temperatures. Let's hope so. There is a lot of cleaning up to do in the vegetable garden in advance of winter. Our friend Jean is an accomplished baker. Her cakes and pies are always delicious and we always enjoy them. 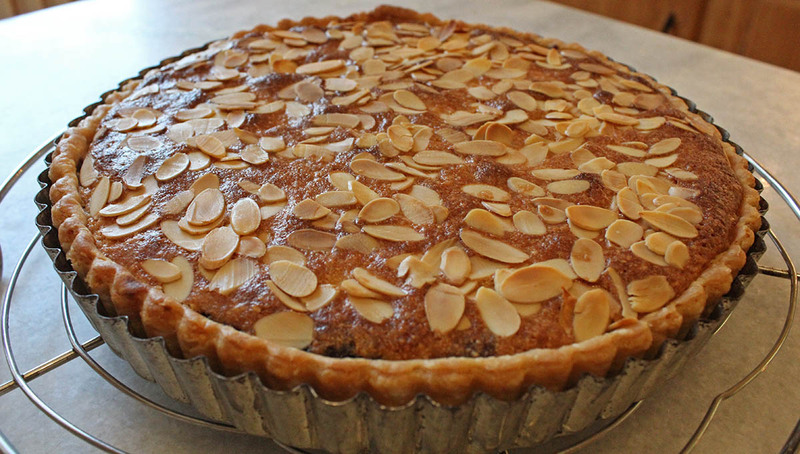 Last year, she shared with me a recipe for Bakewell tart, a local specialty from the town of Bakewell in Derbyshire, England, near to where she is from. 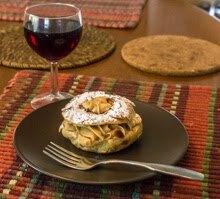 The tart is made in a pâte brisée (what I would call a standard pie crust), with a layer of jam and a filling made with ground almonds. The finished tart can be served plain or sprinkled with powdered sugar. 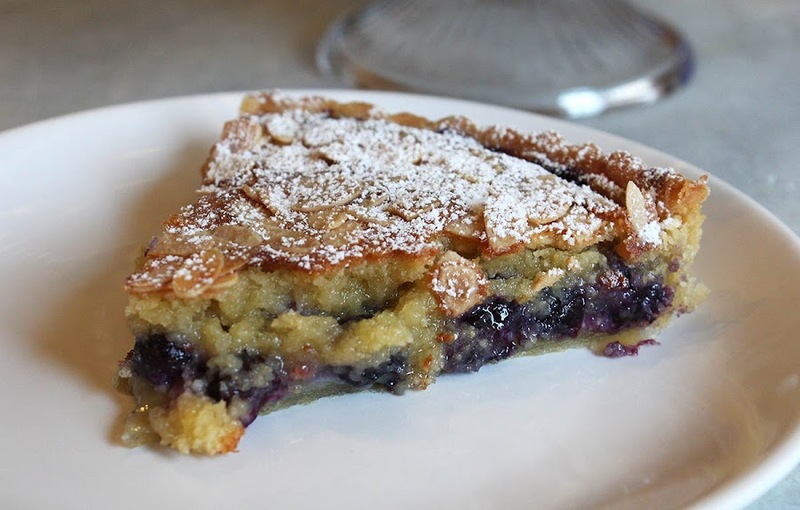 Interestingly, the link to the recipe that Jean provided had somehow been modified and, when I followed it, led to a different version of the Bakewell which called for fresh blueberries in place of the traditional layer of red jam. Since I have blueberries in the freezer (from our berry-picking adventure in June), I decided to give it a try. Blueberry Bakewell tart fresh from the oven. Sliced almonds are baked onto the top. The photos here are from my first Bakewell a couple of weeks ago. I used the berries still frozen and they released a little too much juice into the tart while cooking. The filling didn't set up as firmly as it should have. Still, it was mighty tasty. Last week, I made another one, but I let the berries thaw and drained the liquid off before adding them to the tart. The second tart had a much firmer texture and was as delicious as the first. Good thing, too, because I made it to share with Jean and her husband. Here's a link to the recipe. It makes individual tarts, but I used it to make one larger tart with no trouble. We're expecting our run of dry and warm weather to end this evening with une nouvelle perturbation (a new weather system) moving in from the North Atlantic. They are telling us to expect a serious drop in temperatures along with some rain. Brrr. It's that time of year. 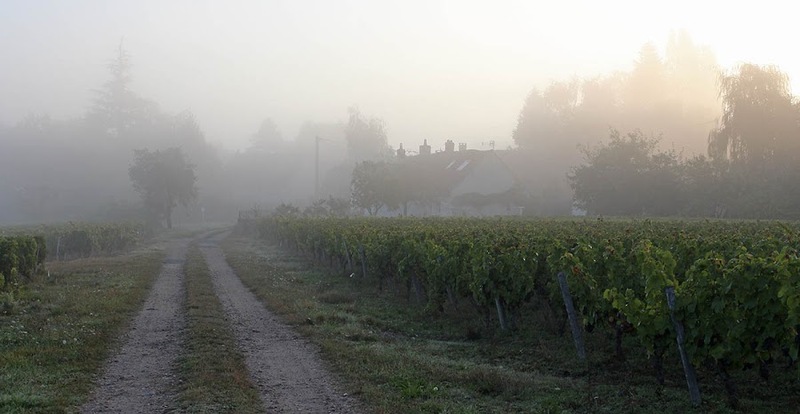 Our little hamlet on a recent foggy morning, seen from the vineyard. Happily, it's way too early for temperatures to approach freezing and they are, in fact, expected to rise again in the coming week. October is when we normally see the fall weather build in. Our fire wood delivery is supposed to happen next week, so I'll have to get busy sawing logs. The guy who does our hedge trimming is coming soon as well. I've asked him to give me an estimate on pruning two of our apple trees. They've gotten too big and I can't prune them myself. Then there's the chimney sweep; we're expecting him sometime in the coming week. It sure feels like fall. This is a follow-on to yesterday's post about Lassie. I decided to put three pictures together to show Lassie, Collette, and Callie side-by-side. Lassie (1964-1977), Collette (1992-2006), and Callie (2007- ). They are very similar dogs, all being sheep dogs, and each was/is very smart. But they had/have very different personalities. These are the only two photographs I have of my first dog, Lassie. When I was about four or five years old, my dad brought a newly weaned collie puppy home. When I saw her, the story goes, I yelled, "It's Lassie!" and that was forever her name. She and I were inseparable those first years. She naturally became the family dog, but I always thought of here as "mine." 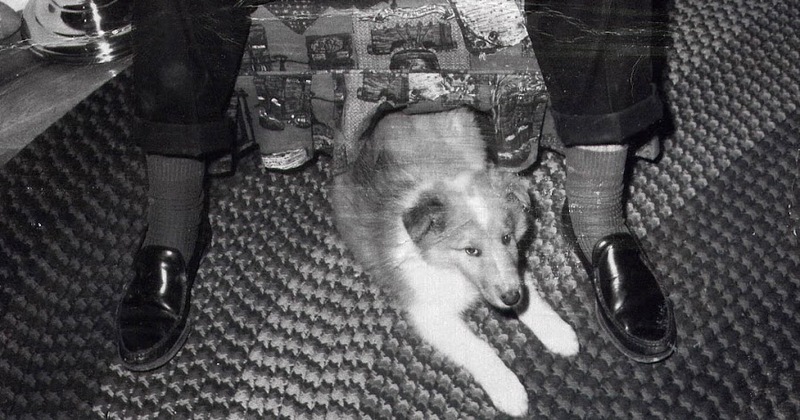 Lassie around 1965, sitting under my dad's chair. Just a pup. We lived in the country at the time and there were no leashes or fenced-in yards. We just went outside and played. Lassie would come and go as she pleased. She did chase cars as a puppy and actually got clipped by one, but it wasn't serious and she stopped chasing cars after that. The years went by and my family moved a lot, and Lassie adjusted every time. And still, I don't ever remember having a leash for her. We just let her out and she wandered around, always coming back home. I remember once, at a campground in the 70s, having to tie a rope around her neck to walk her because they had instituted a leash rule, but that was the only time. 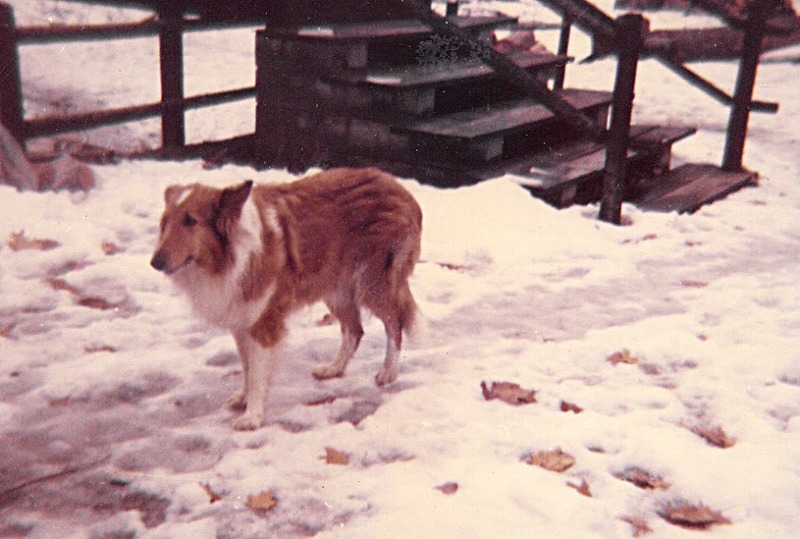 A photo I took of Lassie in 1975. She was still in good health then. In 1977 I was a senior in high school and Lassie was thirteen years old. She developed a series of problems and my dad took her to the vet a few times. The prognosis wasn't good and the last time she went to the vet she didn't come back. I was in denial about it all and pretended that everything was ok, but I really missed that dog. It wasn't until 1992 that Ken and I adopted my second dog, Collette. 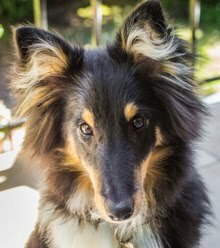 She was a Shetland mix and looked like a smaller version of Lassie. Now we have Callie, another collie (actually a border collie, but they're all related). There's something about sheep dogs! When I was just barely a teenager, I saw a television movie that was the beginning of what would become "The Waltons," a long-running television series in the United States. The movie, called "The Homecoming, A Christmas Story," starred Patricia Neal as Olivia Walton, the strong mother of seven children. The film was set on a Christmas Eve during the Great Depression. 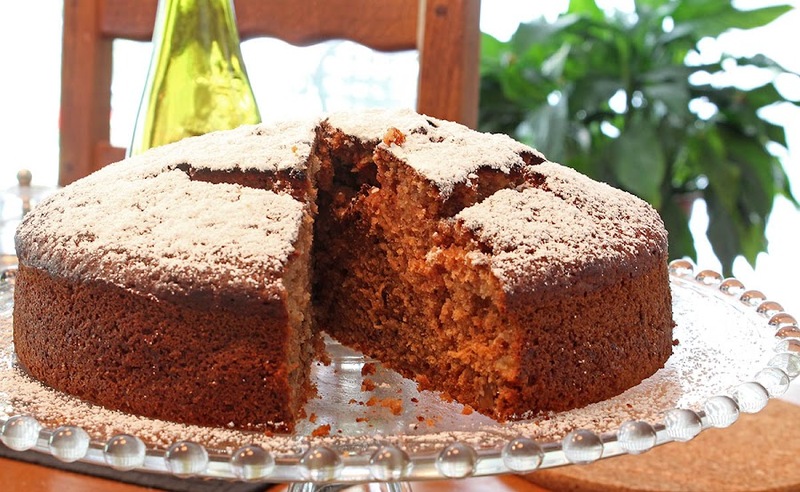 Olivia spent precious money to buy sugar to make her traditional Christmas applesauce cake. I watch that movie on DVD every year now; it's become one of my holiday traditions. My first applesauce cake of the season, topped with powdered sugar. Delicious! Grease a 9”x13” baking dish. Combine all ingredients; pour in prepared pan. Bake 60-65 minutes or until done.